Last month I purchased a Hamilton mantle clock on a total impulse buy in a local clock shop. When I saw it I was struck by how much it looked like a 1958 Drummond. A few days later, while surfing eBay, I came across one of those watch listings with a photo from 3 feet away. I wasn't really sure what it was but it had a 730 movement so I figured it was probably something nice. So I was pleasantly surprised to find it was a Drummond. The Drummond was introduced in 1958 and made through 1962. The case is 10K gold filled with a stainless steel back. The silver dial has solid 14K yellow gold numerals. Under the dial is a 17 jewel 8/0 sized 730 movement. The 730 is a 2nd generation of the 747 movement that was introduced in the 1940's. The main difference is the 730 has shock jewels for the balance. Shock jewels protect the delicate balance staff pivots from damage from accidents like dropping the watch or banging into a door jamb. 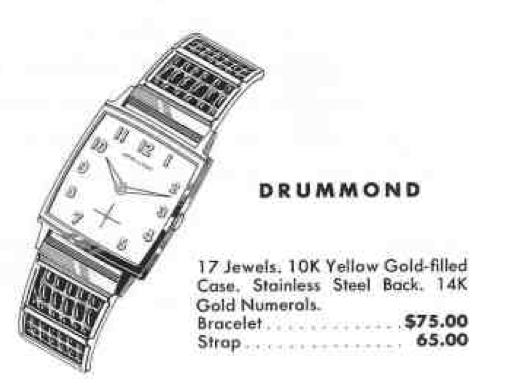 As you can see in the photo below, the Drummond is a watch with a very simple, clean looking design. I just purchased this model on the Bay. It came with the a rectangular crystal someone had adapted. This watch has a subtly curved upper and lower bezel. 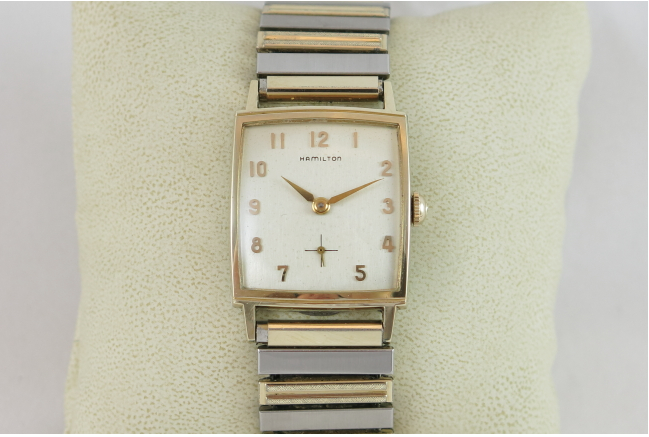 I've found the reference CMY 312-7r for an acrylic but wonder if you know what glass crystals fit this watch? Say B&B W-C or others.